Please subscribe to our channel to support us and to be notified when we upload new videos. Thanks! The Kitchen Cam will be back shortly is working again because we finally got a new IP camera (an INQMEGA IL-HIP321-1M-JZ if you're interested). Not only that, but we also found out the problem with the Digoo BB-M2 IP cameras and think we're able to fix them. So expect new camera locations to be added to the site also! As you may have noticed, our cams have been offline since 1 December. We have bought a new house and are busy moving. For the next 6 weeks we are staying at Miranda's parents place, after which we will receive the keys to our new home on 15 January 2018. Until then, the IP cams will be offline unfortunately. However, we do try to use the Lifecast Cam from time to time at our guest address. Sorry for the inconvenience. When I purchased my Mobius one of the things I wanted to use it for was as a Hat Cam. With a Hat Cam you can film from your eye's point of view and having your hands free at the same time, which is especially handy (no pun intended) when you need both hands such as with controlling R/C vehicles. But when you think of it, the possibilities with a Hat Cam are virtually endless. As mentioned in my post about the Mobius Action Camera I'm interested in buying a quadcopter some day which is capable of lifting the Mobius to record some cool aerial videos. A medium-sized quadcopter would be ideal for that purpose (not too big and not too small). But then I started thinking that I don't have much flight experience yet and since quadcopters fly like helicopters they're not easy to control. I have owned a fixed pitch and coaxial helicopter in the past but never got any further then practicing with them before I got fed up and sold them again :). I've had this camera for a while now and because it's such a great little device I decided to write a little bit about it. The Mobius is a small 1080p action camera at first but can also be used as a dashcam, webcam, photo camera (including a time-lapse photo mode), FPV (First Person View) cam (used on remote controlled vehicles and drones) and security/spy cam (it has motion detection) so you see, it's very versatile! Like I mentioned before I replaced the original lens of my Foscam FI9821W V2 with a wide-angle lens to get a larger field of vision. This is the original lens (3.6mm) that came with the camera. It gives a view angle of 70°. Simply screw it off and screw another lens in (with the same M12x0.5mm thread). The site will temporarily go offline later this evening. When it comes back online you can reach it by it's new domain name: www.cadecam.net. That's right, I just couldn't let go of the CadeCam "brand" :) so I decided the site should have a real domain name again. Too bad the .com address (which I owned for the past 11 years) was already taken by some bogus advertising company so I settled for the .net address. UPDATE 01-01-14 5:00 pm: the transition to the new domain name takes longer then expected so I put the site back online. When the new domain is working, I'll let you know. A new IP camera has been added to the site since the transition from CadeCam.com to CadeCam.tk CadeCam.net. 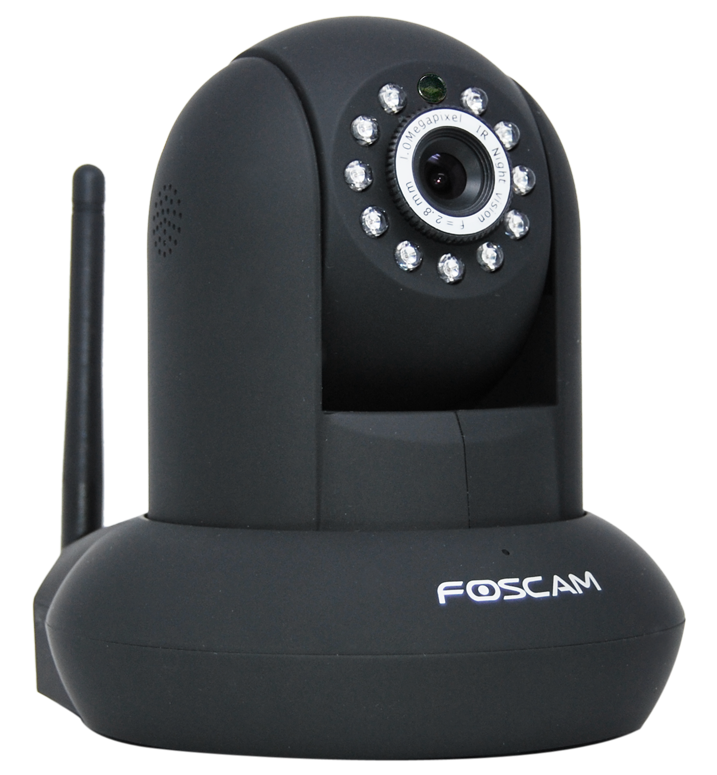 It's a Foscam FI9821W V2 with H.264 encoding and 720P HD image resolution. The standard camera lens has a view angle of 70° but I fitted mine with a 2MP HD wide-angle lens (2.1mm) that I bought from eBay which gives it a view angle of 115°! You can find more info about this modification in this post. You can look at and/or control the cam over here. Enjoy! Unfortunately the Foscam FI9821W V2 (which we used for about 2 years) proved to be very unreliable (it was not accessible anymore after a while) and has been replaced by a Dericam H503W which is still up and running.